A 1964 Cadillac being dug out of the snow near Lake Shore Drive and Foster on Jan. 27, 1967. DOWNTOWN — Remember last winter? "Chiberia?" Snow seemingly every day, and 37 straight hours below zero? How was it only the third-snowiest winter on record in the city? And how was 37 hours below zero not a record as well? 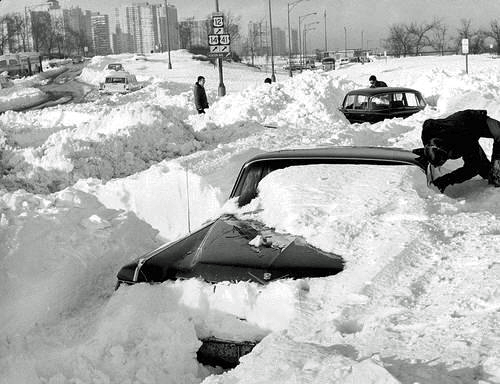 Whether climate change is here or not, Chicago has always been known for its brutal winters. And a look at the records — and our own colorful way of describing the weather — shows that we've survived a lot worse. Snowiest winters: Some 82 inches of snow fell on the city last year. Yet that was only good enough to place third all time behind the back-to-back winter whoppers of 1977-78, when 82.3 inches of snow fell, and the following 1978-79, when a record 89.7 inches of snow fell, in the process blowing Jane Byrne right into the mayor's office. Your commute Thursday was not as bad as this one in 2011. Photo by Scott Olson of Getty Images. Latest snow: Snow stopped falling last year with 1.4 inches on April 14, but that wasn't a record. Eleven times the city has seen at least an inch of snow later than that, most recently on April 16, 1983. May 3, 1907, remains the latest 1-inch snowfall in the city. Can you match the storm with the year it took place? 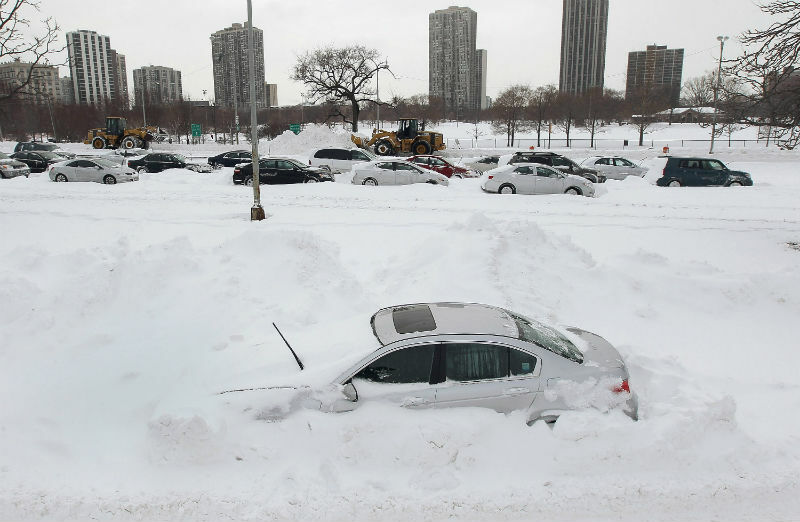 Biggest snowstorms: Chicagoans like big. We're the "City of the Big Shoulders" after all. So "the Big Snow" still refers most commonly to the blizzard of Jan. 26-27, 1967, when 23 inches of snow fell on the city in one big storm. That's followed by the New Year's Day snow of 1999, at 21.6 inches, then the Groundhog Day storm of 21.2 inches in 2011, which became known as "Snowpocalypse," with buses and cars stranded along Lake Shore Drive. (That storm was marked by gusts of 60 mph and updrafts that produced lightning and "thundersnow.") Rounding out the top five are the 20.3-inch storm of Jan. 12-14, 1979, commonly just called the "Blizzard of '79," and now the 19.3 inches that fell Sunday, just edging out the 19.2 inches that fell on March 25-26, 1930. 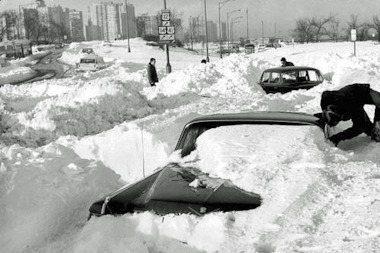 A few more things about '67: "Some of the snow from 1967, there was so much of it, they didn't know what to do with it," said Peter Alter, resident historian at the Chicago History Museum. "They put it on train cars, and they shipped it to Florida for kids who had never seen snow." Alter pointed out that, oddly enough, the Big Snow, like the Blizzard of '79, took place during an election campaign. Yet it left Mayor Richard J. Daley largely unscathed, unlike Mayor Michael Bilandic 12 years later. "What is a consistent thread is how messed up public transportation and traffic gets," Alter said. In both cases, buses were halted in their tracks, and cars were abandoned, which happened again in 2011. Yet, because '67 was, and remains, the city's biggest snow ever, voters were willing to cut the first Mayor Daley some slack. That was something they weren't so eager to do for Bilandic — especially African-American voters left stranded on "L" platforms on the South and West sides by the Bilandic administration's "skipped stop" policy at the Chicago Transit Authority. Here, a motorist digs out his 1964 Cadillac from Lakeshore Drive and Foster. Photo courtesy of That Hartford Guy on Flickr. The week that was. Last winter, harsh as it was, couldn't place a single storm in the city's all-time top 10. But the 23.1 inches that fell over one week, from Dec. 30, 2013, to Jan. 5, 2014, placed seventh among the city's snowiest weeks, and it was noteworthy in that all the weeks that placed above it had a top-10 storm at their core. Last winter didn't hit with one big blast; it hit with extended consistency. The Hawk. Nobody is really sure how Chicago's winter wind off Lake Michigan came to be known as "the hawk." It apparently derives, in part, from African-American vernacular referring to cold weather outside as "Hawkins" or "Mr. Hawkins," as in a 1936 Chicago Defender citation: "Hawkins has got us." Yet the 1991 second volume of the "Dictionary of American Regional English" specifically cites "the hawk," also "Hawkins," as "the wind; especially that of winter ... chiefly Chicago chiefly among black speakers." A 1964 "Jazz Lexicon" says "Hawkins" in that usage among musicians goes back to 1900, and "the hawk" to 1935. (Those who believe it derives from the blowing of saxophonist Coleman Hawkins ignore his characteristically warm tone.) The online Urban Dictionary entry likewise links it directly to Chicago and, by extension, Great Lakes cities like Gary, Ind. Yet "the hawk" got its strongest endorsement from Chicago's own Lou Rawls, who talked of it in a spoken introduction to his mid-'60s classic "Dead End Street." "DARE" cites the opening on a live album, in which he says: "In the wintertime when it's very, very cold ... when it's around 10 above zero and it's about 12 inches of snow outside, and the hawk, I'm speakin' of the almighty hawk, Mr. Wind, when he blows down the street around 35, 40 miles an hour it's just like a giant razor blade blowin' down the street, and all the clothes in the world can't help you." In a 1967 TV performance, since posted on YouTube, he adds, "Cuz in Chicago the hawk not only socks it to you, he socks it through you, like a giant razor blade blowing down the street on some of these windy days." Alter said there are reports, from back in the day, of ropes being strung across State Street to help pedestrians get across intersections while staying erect in whipping winds. Looking downright balmy last winter. Photo by Scott Olson of Getty Images. Blizzards in Chicago literature: Alter pointed to Upton Sinclair's muckraking novel "The Jungle," in which a storm is so brutal a character's ear actually freezes and snaps off. The big snow in Theodore Dreiser's "Sister Carrie," however, actually takes place after the action moves to New York City. Alter said the museum is working on an online exhibit, perhaps to be ready this spring, based on a diary written by a street-car conductor named Whiting, including a Feb. 12, 1894, snowstorm. That storm dumped only 7 inches on the city, but gusts were estimated at 84 mph, and it froze traffic. The Tribune reported: "Street car transit during the morning and early afternoon was almost a matter of luck." Still sounds familiar today, doesn't it? Returning to "The Jungle" milieu of the stockyards, Alter said the March 1930 blizzard (No. 5, remember?) wreaked havoc in Back of the Yards. "The meat-packing area was so snowed in, they couldn't move the cattle around," Alter said. "There was a problem with animal waste." That stench, he said, could get even worse during heat waves — but that's another story entirely. Last winter didn't have one big snowstorm: It just kept coming. So it did earn one top spot in the record books. From December through March, the temperature averaged 22 degrees, the lowest figure over that span of months in Chicago weather history going back to when records were first kept in 1872, the year after the Great Chicago Fire. 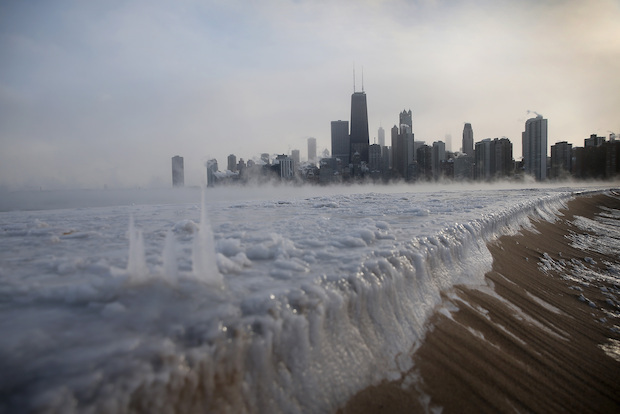 So in that, last winter, the coldest Chicago has ever experienced, fully earned a moniker like "Chiberia." All records found online through the National Weather Service.